I knew this book would be moving and emotional just from the synopsis, and it certainly was. In Never Eighteen, Megan Bostic takes the reader on a physical and emotional journey right along with Austin, leaving us, like those he visited, changed at its conclusion. Let me just say: Wow. For a book that is on the short side, Never Eighteen sure packs a LOT of emotion. With the exception of Forbidden by Tabitha Suzuma, I don't remember the last time my heart broke for so many characters in a single book. Every stop on Austin's journey yielded a new story for him or for his friend, stories that were by turns painful, touching, and beautiful. In addition to the depth of this book, I loved the way in which it was told. The writing was a unique blend of conversation, quasi-stream of consciousness, and narrative, and I truly felt everything that Austin did. Everything flowed well together, even the moments that were difficult or awkward. And yes, I will admit that I did have tears in my eyes at the end of this book...and I know that I wasn't the only one. The only thing I did want from this book was more. I would love to know how Austin's visits affected everyone in the long run. Even without that, I've found myself thinking about this book long after it was over. Never Eighteen has a powerful message and one that I think readers of all ages can appreciate. Never Eighteen is a compelling debut by Megan Bostic, one that is full of more poignant moments than many books I've read. I cannot wait to see what this author writes next! Great review! 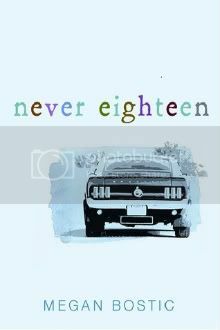 Never Eighteen sounds like a phenomenal story. Adding it towards the top of my TBR pile now. Thanks! I have passed over this a few times. Thanks for the great review, reminder and recommendation. I will have to give it a try. This book sounds amazing! Really emotional stories are always the ones that stick with me the most. I'm glad you loved it!